Trion had their 27th March 2015 Friday Livestream where they talked about the upcoming 3.2 Wardrobe System and showed off some of the bosses of the upcoming Tier 2 Hammerknell 20-man raid. A few other tidbits were provided for other areas of the game, including visible Elo Rating for PvP. Click here for a replay of the 27th March 2015 Livestream video on twitch.tv. RIFT portion starts at about 2hrs and 2min into the video. Trion had their 28th March 2015 Friday Livestream with Livestreamer “Cole” Marshall, Game Designer Haley “Anony” Chivers, Game Designer Marko “Epsiry” Sohrakoff and Senior UI Artist Amber “Gingers” Alexander. 3.2 Wardrobe System: Wardrobe Collection, Dye System, Weapon Wardrobe, Transition to 3.2, Achievements, Set Collections & Favorites, Other Info. Tier 2 Return to Hammerknell: General HK Info, Old HK Achievement to Legacy, Specific Boss Information, More Loot. Other Info: Mounts Sorted by Speed, Bag Search Commands, Visible Elo Rating, New Warfront, Livestream Chat Tidbits. Gingers went over the wardrobe system coming in 3.2. You can find the bulk of information in her 3.2 Wardrobe Update article. A bit of further explanations and how-to were given in the livestream. There’s a new Wardrobe Collection system in place. You collect appearances when an item hits your inventory. Existing items in your inventory/bank/etc will also be included on transition. Wardrobe Sets unchanged. So you can unlock up to 39. You can rename your Wardrobe Sets. Commands remain the same /wardrobe #. i.e. /wardrobe 4. Slots have become buttons. You click on it (say Legs) to display a new window with all the Legs you have collected. As you can see they are sorted by Costume or armor type (Leather, Chain/etc). How many you can see is based on how many appearances you have unlocked. There’s also a “Show Uncollected” tickbox at the top of the window if you want to see all the items you have not collected, and a drop-down so you only see appearances from a certain category (like ‘Leather Shoulders’). There’s also a search field. At some point after 3.2, Trion would like to add a Favorites category so you can right-click any appearance and bring it to the top in its own Favorites category. Make sure to click “Save” after your changes, or simply close the window and it will revert back to your old wardrobe. 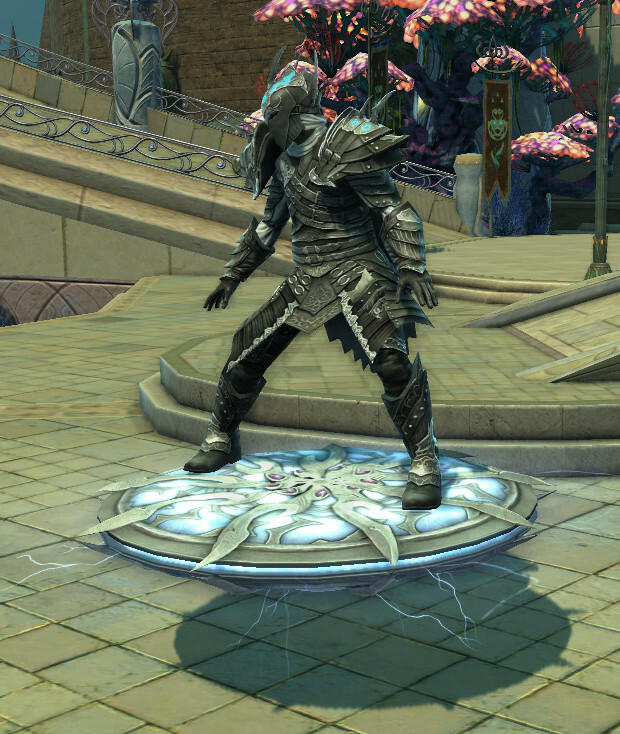 If you want to ’empty’ a slot, you can just right-click on the slot and it will switch to your currently-equipped gear appearance. If you want to go ‘naked’, just untick the checkbox next to it like you do now. The dye system has changed. Dye colors are now tied to the dye slot, not the item itself. Example: Say you have Primary: Blue and Secondary: Red dye color for the Helm slot in Wardrobe Set #3. If you change the helm appearance, the helm will automatically have Primary: Blue and Secondary: Red dye for that particular wardrobe set. There’s also now a Dye Bucket system. The dyes in the Dye Bucket System are unlimited-use dyes. You will initially get a few dye bucket unlocks for free. The rest you will need to purchase with Credits. Pricing currently unknown. Dye Bucket Unlocks are account-wide. Dye Buckets are not tradable. Those with the Nightmare Black dye from the Ultimate Nightmare Edition Pack will have that unlocked for unlimited use with the new system. The existing one-use dyes will still remain. You apply them to a dye slot in your wardrobe set by clicking on the slot. They will not be added to the Dye Bucket system (so they won’t become unlimited use; one-use dyes remain one-use dyes although there will be unlimited-use versions). There’s two toggle buttons in the top-right corner of the dye window. Paint Brush – Allows you to simply edit a single dye slot. Paint Bucket – Allows you to edit the dye color for all dye slots. Items that you can’t dye right now or have only one color will still remain like that. If you want additional dye options for an item that can’t be dyed right now, best to ask in Suggestions. Weapon wardrobes are getting a buff. You’ll now be able to choose weapon appearances for each of your wardrobe sets, and for each of the available weapon slots for your class. I.e., Rogues can’t wield shields, so there’s no shield wardrobe slot for Rogues. The weapon wardrobe you see will depend on what weapons you have equipped in your character’s gear slots. I.e. If you wield a 1h+oh, the 1h+oh weapon appearances in your currently selected wardrobe set will appear. If you switch to a 2-hander, the 2-hand weapon appearance will appear. Weapon Wardrobe acts like the other wardrobe features, so you can have separate weapon appearances for each wardrobe set. The Transfiguration Bauble will no longer be relevant. It still exists, but Trion will remove it from the RIFT Store because you can just use the new, free weapon wardrobe system. You can still apply appearances to your actual gear just like you do now. Although weapon wardrobe has priority, you can view the baubled item appearance by right-clicking the weapon wardrobe slot/s and making them empty. This will allow you to see the character’s equipped weapon. When 3.2 hits, all your existing items in your inventory/bank on all characters will have their appearances automagically collected. For your existing wardrobe sets, the appearances/dyes will remain in their respective slots within your wardrobe sets. However, the actual items will be sent back to you via in-game mail. Items you have earned previously but since discarded, like certain achievement rewards. Items you have transfigured. The transfigured appearance should also be automatically unlocked when 3.2 hits. A lot of achievements will be added in with the new Wardrobe System. Stuff like ‘x number of Legs’ and ‘x number of Helms’ collected for now. In the future there might be achievements for collecting sets, but not for 3.2 launch. Trion would like to add a Favorites category to each slot as well as Set Collections so you can track available sets and which pieces you are missing. However, they ran out of time so these won’t be available for 3.2, but will probably be coming in the future. Currently no plans to add titles, mounts and pets to this new system due to resource/time constraints. New Wardrobe System comes with Patch 3.2. ETA on 3.2 is currently unknown, but slated for some time in April. Changes will be on PTS soon, but no ETA. Showed off some of the Return to Hammerknell Tier 2 20-man raid. All 11 bosses from the original Hammerknell Fortress will be available. All HK bosses will be available on 3.2 release. No skipping of lower wings; so you can’t skip to the upper floor. Must kill all lower-floor bosses first. There’s a ton of neutral ‘Lost [Soul] Soul’ wisps all over the place with each Class’s souls (i.e. ‘Lost Sentinel Soul’). Unknown what the exact mechanic for these wisps are. As the heading suggests, mounts will be sorted by speed with 3.2! When 3.2 hits you will now be able to see your Elo Rating. Currently this is hidden, but will be visible under the PvP tab in your PvP window (default key “k“) going forward. Elo rating is based on your win/lose record in Warfronts. The more you win, the higher it is. If you win against players with higher Elo Rating than you, your score will go up a lot more than against a player with a lower Elo Rating. Whilst showing off the Elo Rating, the default Warfronts tab in the PvP window revealed a new warfront: Hive Kaaz’Gfuu Assault. No other information was made available as the livestreamers did not touch on this new warfront. We’ll just have to wait and see what it could be. For now you can check out on some speculation about the warfront here. New Gear Appearance. Vladd mentioned that new HK gear will have a new appearance. Anony’s helm drop uses the Mage NT craft helm gear model – unsure if that’s what Vladd means or if there’s actual new gear models for Return to Hammerknell. Dyes. Archonix will ask Marigold about dye colors coming out ‘different’ on the Butler’s Bundle. Sun Dresses. Not sure if it was a joke, but Archonix stated that Trion is working on allowing ‘Sun Dresses’ for male Bahmi’s. 1x Ducklar Companion Pet to 3 livestream viewers. 1x Minion Card: Rough Raptor to 3 livestream viewers. [Rarest card in the game; only other time available was during Extra Life 2014 charity event, and the previous livestream]. 1x Levitate Mount to 5 livestream viewers. A lot of information provided for the Wardrobe System coming in 3.2! Also an interesting sneak peek at the Tier 2 Hammerknell Fortress 20-man raid and other tidbits like mount speed sorting and visible Elo Rating for PvPers! is that true, that hamerknells old (50s) achievments will dissappear, when the new (65s) comes out? i heard about that, + mount (50s meta) is not available anymore? That was the case on the PTS. Not sure if it will carry over to Live or if it’s just a bug that Trion have yet to address. Hey Darula; checked the livestream again and Anony does briefly mention that the old HK achieves are going to become Legacy. No indication of whether the old conqueror mount + title will be unobtainable anymore though, although usually if something becomes Legacy, Trion has not made their rewards obtainable via other means.